Some Motorola Mobile Schematic Manuals PDF are shown above. The history of the American company Motorola is inseparable from the history of mobile phones. However, before they occur the company is a world leader in a number of ways. The birth of the company, as well as the first 30 years of existence, associated with the name of the founder Motorola, Pol Galvin. Thanks to this charismatic company has become a leader in the field of radio communications. Also, when it bases further success Motorola were laid - as a manufacturer and supplier of semiconductors. What ultimately led the company in the telecommunications market, where Motorola is now one of the leading players. September 25, 1928 in Chicago, Illinois, the company appeared Galvin Manufacturing Corporation. It was founded by Paul Galvin and his younger brother Joseph. Prior to this, Paul has twice had a bad experience of doing business - in the production of batteries for portable radios. And this time, the beginning is not impressed. By the company's assets were treated 565 dollars (share Joseph E. Galvin), equipment for the production of network power supplies (bought by Paul at last $ 750) and a network rectifier design. Initially it rectifiers, allows you to power a portable radio on the network, were the main products of the company. Then Paul Galvin with his usual vigor switched to a new market - radios. In 1930, the company introduced the first low-cost ($ 110 value) and practical (not required to turn off the engine) car radio. For the purposes of advertising, Paul Galvin even posted it in his car. The car radio was the hit "the bull's eye." By the end of the year sales reached 287,256 dollars. For car radios Paul Galvin came up with its own brand - Motorola. Following the car company began producing portable radios. As the assortment decisions in 1936 were special car radios for the police. They were tuned only to one frequency. Cooperation with the state did not end there. Has an amazing intuition, Paul Galvin foresaw the Second World War. Therefore, companies have started creating an army of portable station providing duplex communication. In 1940, there was Handie-talkie radio. And the company's revenue increased due to military orders many times (up to 9,936,558 dollars). In 1943 he published an improved radio Walkie-talkie. She was even smaller and more perfect. And also gave the name of an entire class of devices, like the photocopier in Russia (under the name of Xerox products). Today the "walkie-talkie" called all handheld radios. With the end of war Paul Galvin (and, consequently, and the company in general) began to look for new markets. And already the first TV company was developed in 1947 - Golden View. As in the case of radio, television reflected on the success of the policy of price dumping (179.95 dollars against 300 competitors). Paul Galvin was not afraid to produce products with a minimal margin. It is because of the cheapness of televisions have become a mass product. This provided the company's market share and boosted sales. Also in 1947 the original name of Galvin Manufacturing Corporation changed on the current Motorola Inc. In the early 50s the company began to develop the production of semiconductors. That it will become a component of the future success from Motorola. Already in 1956, the company introduced the transistor radio. And also - the world's first pager. In subsequent years, Motorola has developed in several directions. Improved radios, began production of automotive synchronous generators. With the direct participation of the company came to a CRT color TVs. the first transistor color televisions were released. Motorola products are widely used in the NASA space program. Including, lunar expeditions. In 1974, Motorola launched its first microprocessor - 6800. Further, the company has become one of the prominent players in the market of processors. Still, the most important event in the history of the emergence and further development of mobile phones and mobile communications in general. The first mobile phone call was made April 3 1973 Motorola engineer Martin Cooper. Although it started much earlier. The history of the emergence of mobile communication you can find in the corresponding material. Here it is worth to stay on the contribution from Motorola. Before the brainchild Motorola customers were offered a car radio telephones (the company AT & T) (User Manuals PDF page). The devices weigh more than 10 kg and were installed in the car trunk. Therefore, the first cell phone, Motorola DynaTAC (Dynamic Adaptive Total Area Coverage), weighing just over 1 kg, was the revolution. It was one of the most expensive projects of the company. It cost $ 100 million and 10 years of research. 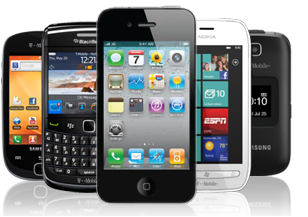 Has been developed in parallel with the competitors of AT & T Bell Laboratories. Not surprisingly, Martin Cooper made the first call Joel Engel of AT & T.
Motorola - the history and current status. Motorola has always been one of the leading in the number of innovations. As in the case of the clamshell, the company first proposed a new form factor - roteytor. The pioneer was the model Motorola V70. The highlight of the machine is a rotating design. The upper part was rotated 360 ° relative to the bottom. Operating position was the turn of 180 °, in which that becomes available numeric keypad. No less interesting was the display Motorola V70. Unlike previous models, he was highlighted. Subsequently, the display with white text on a dark background used in a number of other devices. The model number of the latest Motorola phones have become such MOTOFONE F3. it display was made by another technology, it is very economical. Noteworthy and placed inside a circle with a screen. Unlike subsequent roteytorov, was just turning the cover, the display itself remains stationary. The rim around the screen proved to be interesting, catchy. Subsequently, a similar solution was used, oddly enough, in the extra-Motorola C115 / S116. Functionally, the model V70 was ordinary. Her "filling" repeated clamshell Motorola V66, is not the most advanced model of the company. There were no alarm clock and voice recorder. Inflated price (about $ 500) was justified by the unusual appearance. Unfortunately, this circumstance did not allow Motorola V70 become mass. The second (and last to date) roteytorom company became phone Motorola V80. It came two years after the V70, in early 2004, and it was a completely different machine. Even the opening mechanism was different. The upper part can be turned by 90 ° and thus enable the camera. At the same time the horizontal orientation of the screen to allow easy shooting. Functionally the device repeating triplets telephones Motorola V300 / V500 / V600. So, it was very technologically advanced for its time. But, as the V70, it was primarily a fashion solution. Consequently, the cost of Motorola V80 was very high, which again prevented make model popular. It did not help, and a dizzying peak prices: The unit of the original cost of about $ 500 at the end of the sales could be bought in the "Euroset" for 4990 rubles. With only accelerate the withdrawal from the market model. Form Factor roteytora not caught on yet. Also in 2004 he published a model of Sony Ericsson (User Manuals PDF page) S700i. This unit could be called a phone-dream: a huge screen, high quality camera, multimedia stuffing. But, alas, it also became popular. From next roteytorov can remember except that Walkman Sony Ericsson W550i / W900i yes female model Nokia (Service Manuals PDF page) 7370. Today roteytorov form factor represented a pair of models from Samsung (Service Manuals & Schematics PDF page). Perhaps in the future the situation will change. Modern range of eclectic. It mixed the representatives of the previous generation (triplet platform, budgetary decisions), the new Linux-based solutions, the model stand apart. All together seems too fragmented, individual solutions are fragmented. Motorola's product line was redrawn several times. Perhaps, it is not necessary to describe its history. Therefore, we present the classification at the moment. It is possible that it will change in the future. Low cost solutions make W-family of products. Because modern solutions here can recall candybar W208, W375 clamshell. Last year's line SLVR (MOTOSLVR), KRZR (MOTOKRZR) also fragmented, the latest models are, respectively, L9, and K3. The current classification system is built around four main lines. The RAZR - media solutions - enriched with three new solutions RAZR2 V8, V9, V9m. However, there are Linux-based solutions and P2K-phones. ROKR line is positioned as a musical. It marked Z6 model, U9. Multi Q line will be presented QWERTY-decisions, development of family Motorola Q. The future line of ZOOM will include camera phones Z10, Z12, and so on. Some of them are built on UIQ-platform.